These red velvet mini cakes are a perfect party dessert. They don't just look gorgeous, they taste awesome too. These are eggless to - so anyone can enjoy them. Time flies fast. Just a few days back, we were all welcoming the New Year; and now the first month of the year is already heading towards its end. This post was supposed to be published to welcome the New Year, but somehow I just kept postponing it. As the saying goes better late than never; here I am with the much-delayed post. For the frosting, I used the readily available soy-based whipping cream. For a more authentic red velvet cake, a mascarpone cream frosting is recommended. I had plans to prepare mascarpone cheese at home. But, due to lack of time, I dismissed the option; maybe some other time. Here are some more baking recipes for you to try. 1. Preheat the oven to 180 C. Keep 6-8 mini cake pans greased and dusted with flour. 2. In a large mixing bowl add all the dry ingredients - flour, cocoa powder, baking powder and baking soda and stir so that the flour mixture is uniform. 3. In a separate bowl add butter and sugar in a mixing bowl till well incorporated. Add the colour, yoghurt and water and blend well. Add the dry mixture to the wet mixture. Stir to form a smooth batter. 4. Fill the prepared pans with batter halfway. Bake for 15-18 minutes. When done a skewer inserted in the middle would come out clean. Leave them to cool down completely before icing. 5. Whip the cream and keep in the refrigerator until needed. Once the cakes are cooled frost the mini cakes and use sprinkles for decoration. wow gorgeous heart shaped cu cakes :) looks fantastic !! Pretty looking cup cakes , I love the deep red hue that you have got there . Bookmarking ! Heart shape cakes are so cute. 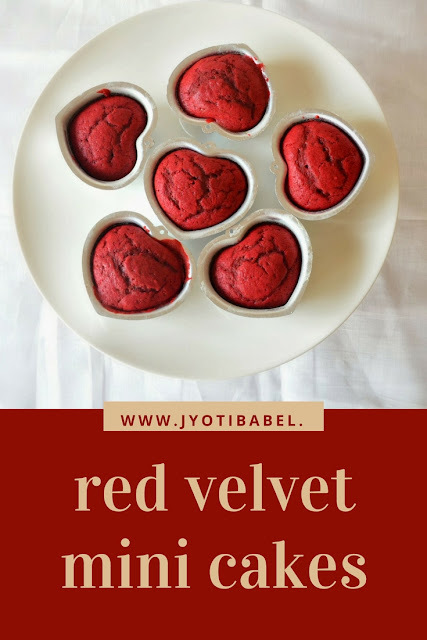 Red velvet cakes are good for any occasion; New Year's, valentines day or any celebration. Wow.. They are so cute and addictive..
Those hearty shaped red velvet cupcakes look very cute and inviting. They look adorable all decked up with frosting and confetti in the last pic. They look so cute. 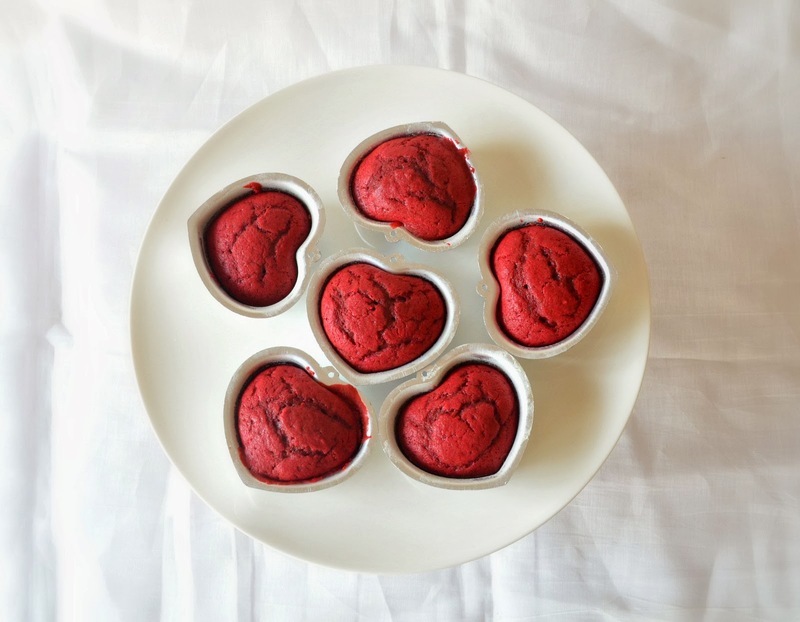 The heart shaped red velvet cupcakes are perfect for valentines day or anniversaries. Those heart shaped cakes look so cute and inviting..very nicely done! They look very cute. Love the way you decorated the cupcakes. Those tiny cakes are so cute. 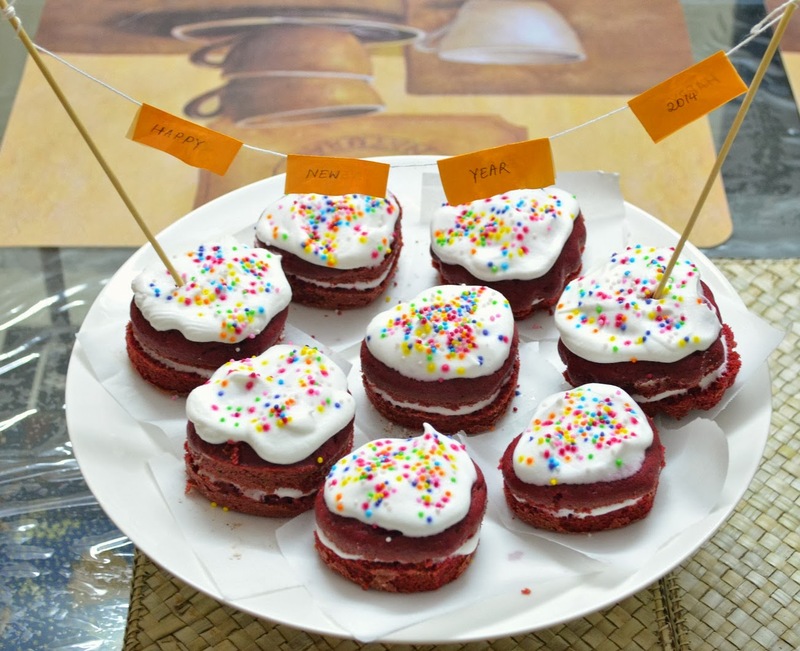 Perfect for any celebration..
Those hear shaped mini red velvet cakes looks super cute Jyoti. Omg, how cute and attractive those red velvet cupcakes looks and they are very catchy as well. Drooling here.